Stettler, Alberta’s bike share program has been suspended after the program’s single bicycle went missing in that town of about 5,700 people. Bike Share Program Director, Harold Bruce spoke to the CBC about the program he founded after returning from a visit to Toronto, where he had thoroughly enjoyed Toronto’s BIXI bike share program. 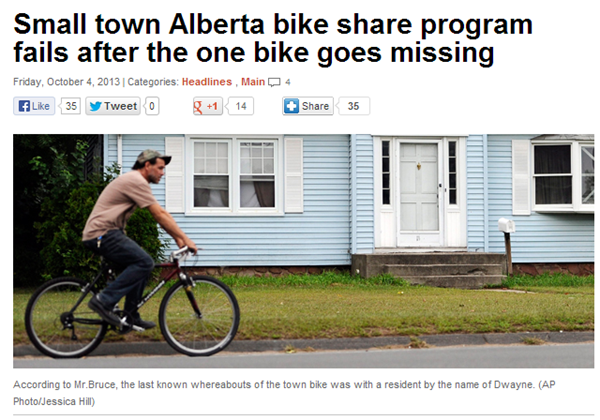 He then approached Stettler’s town council and started Stettler’s first and only bike share program. Listen to the interview in its hilarious entirety on CBC Radio. “That’s the, uh, property of the Stettler Bikeshare. It’s not your bike.” Amazing. Seemed like a 22 Minutes skit or something (but actually funny), hilarious. is this a joke? or for real?